How have coal shipments changed since the passing of the Acid Rain Program of the Clean Air Act in 1990? Are we simply trading one set of environmental impacts for another? This project looks at the environmental impacts of coal transportation around the US. 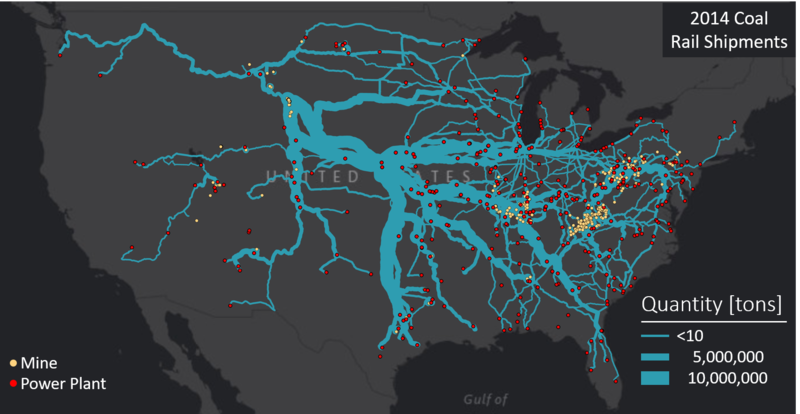 We combine data from the Department of Energy's Energy Information Administration with transport network data and coal mine and coal power plant locations from the Environmental Protection Agency. An initial analysis focused on rail transport to determine that a significant percentage of total life cycle carbon dioxide emissions from coal-powered electricity generation are associated with transportation of the fuel by rail. Future work on this project will look at transportation by water and by road. This project will also look at impacts besides global warming, such as land use. If you like what you see and want to work with us, we'd love to hear from you.